← Did metamorphosis evolve through hybridization? A scientific cautionary tale. 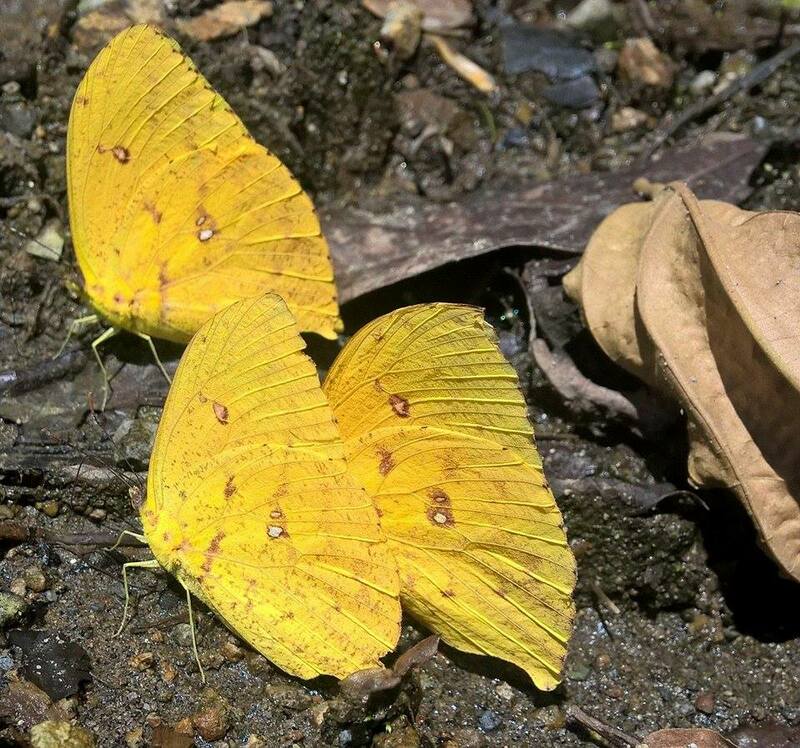 The short of this answer is that butterflies have a behavior where they sit on river banks, dead stuff, or poop and lap up the salts and minerals. It’s a behavior that can be seen in a few other insects like bees and flies, however is most apparent in butterflies. Let’s take a further look into how and why butterflies puddle. General butterfly mouthparts. Well, the ones that are important for this article. Also, drawn on the back of a placemat in Ecuador. Now that we’ve made it through the vocabulary, I can show you some cool pictures. It was previously thought that butterflies could only drink liquid due to their straw-like mouth parts. This gave rise to the question, how can butterflies drink viscous material and lap up salts from the sides of rivers? The answer is with sponges. Little sponges. Microscopic sponges. Remember all those fancy words a few paragraphs up? Well, now here is where we’re going to talk about them some more. The proboscis is hollow inside. The two fused galeae make a channel called the ¨food canal¨since that’s where the food gets sucked into. At the tip of the proboscis lie the legulae. The dorsal legulae (the one on top) forms overlapping plates where as the ventral legulae (the ones on the bottom) form tight interlocking hooks. These legulae form the sponge at the tip of the butterfly’s tongue. 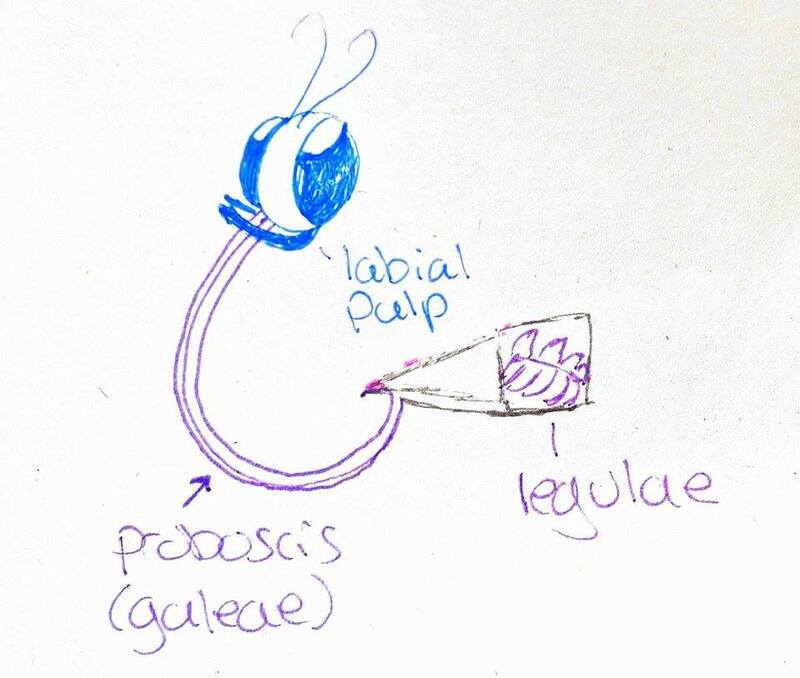 The liquid sticks and pools in the sponge (legulae) and then is sucked up in the food canal (galeae) by capillary action. 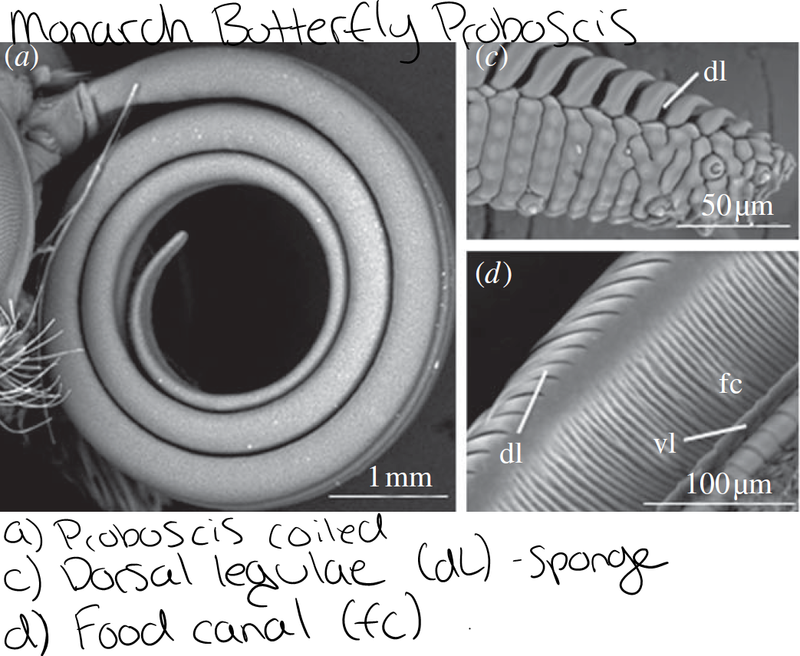 The butterfly proboscis has been around for quite some time with this sponge. In fact, it’s been here since the Jurassic period but we really see a diversification in butterfly species during the Cretaceous (146MYA). This was at the same time that plants were diversifying Therefore, we think as the plants developed different types of flowers and fruits, butterflies (and moths) diversified to eat a wide range of foods. This includes rotting fruit. The sponge at the end of the proboscis allowed the butterflies to access more resources. The same sponge that opened up the rotting fruit option allowed butterflies to absorb nutrients from the soil. Butterflies actually eat many different things. We tend to think of them as only as nectar feeders but butterflies will eat pollen, fruit, sweat, tears, and blood. Each of their microsponges have slightly different shapes based on what they eat. In fact, there are several non flower feeding butterflies that solely feed on fruit. These butterflies have lots of little hairs at the end of their tongue that appear to form a flat brush. The butterflies sweep the surface with their tongue and will dab wetter surfaces. The butterflies also will spit onto their food if it’s not wet enough to eat. Isn’t this one of the questions of the century. While most species of butterflies puddle, it’s usually only the males that we see puddling. Therefore, we naturally assumed that the males needed some extra nutrition to give to the females during mating. Male insects deposit a sperm packet inside the female. This sperm packet includes sperm but also has essential amino acids, salts, and proteins. So we’re assuming the butterflies are looking one or two things. Sodium (salt) and nitrogen (to build proteins). 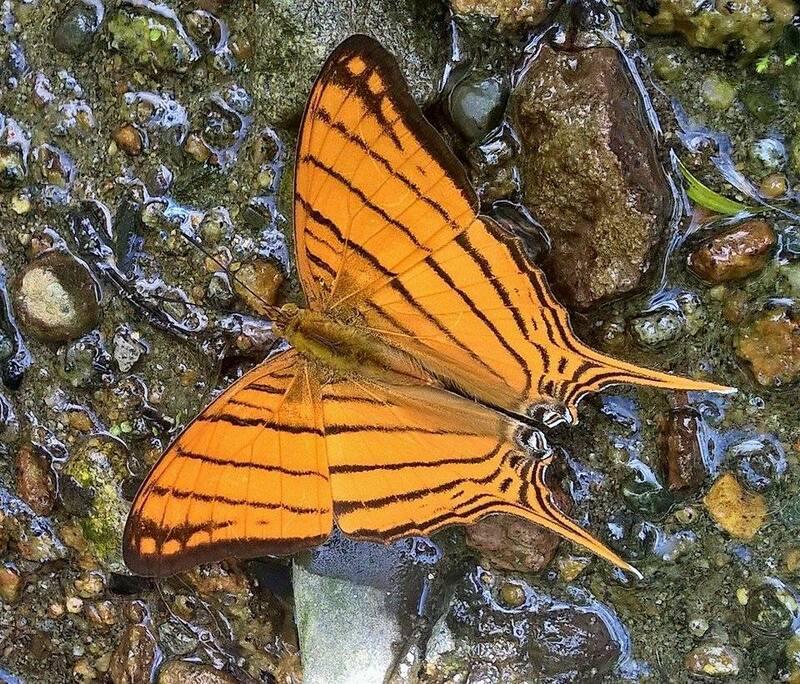 Puddling Orange Daggerwing (Marpesia berania) in the Maquipucuna Ecolodge in Ecuador. Despite several studies looking into it, it appears that sodium doesn’t affect female reproductive success. If them males uptake a lot of sodium it doesn’t seem to make the females lay more eggs. Males of the African Fruit Feeding Butterflies had smaller sperm packets and took longer to mate when depleated of sodium but again, the female’s reproductive success was unaffected. There are some other ideas that more of the eggs hatch with sperm from males that ate more sodium. There’s another hyothesis that sodium helps with sperm motility but ants are known to puddle for salts also, and they don’t have sperm since the foragers are females. Another idea is that sodium helps amino acid uptake in the gut which helps the insects grow bigger and faster. There is supporting evidence in aphids and skipper butterfies but Japanese beetles died with added sodium. Aside from reproduction, it’s thought that maybe the male butterflies are more active and fly more and therefore need more salts to fuel their muscles. However, this doesn’t hold up consisetnly either and again ants puddle for salts and the foragers don’t have wings. Nitrogen is the other thing the butterflies are probably looking for. We don’t know exactly what it’s doing, but we do know that we can trace nitrogren from when a male eats it to the eggs that the female in which he mated with lays. We also know that the cockroach Xestoblatta hamata actively feeds on bird poop (which is super rich in nitrogen) right before mating. But basically, the sum of it is that we still don’t really know, although something to do with mating is probably most of the answer. We also don’t know how their guts are suited to handle the uptake of these minerals but there’s a possibility that not all species of butterflies puddle on all types of surfaces. Butterflies just sit on poop, carrion, and riverbanks for sometimes hours at a time. They’re relatively docile and can often be handled. So this begs the question, don’t predators eat them? And this hasn’t been looked into much either. 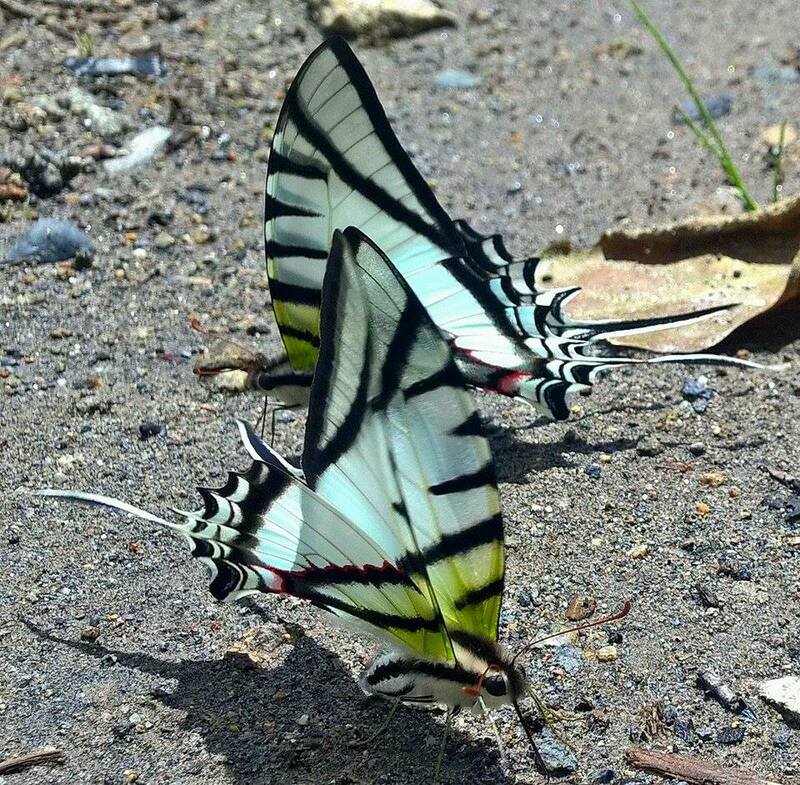 Butterflies often puddle in groups which seems to save them from bird attacks. Butterflies feeding on poop are especially docile and it could be that they’re temporarily inedible to predators. There’s also some evidence of disease transmission as the butterflies that puddle on tears transmit diseases to their vertebrate hosts. But basically we just don’t know and we need some more researchers. If we puddle together in groups then we’re less likely to be munched on by predators. Butterflies sit on poop, dead things, and riverbanks to absorb minerals like nitrogen and sodium. We’re not really sure why they do this, but the limited evidence we have seems to suggest it’s important for mating in some way. Butterflies are able to puddle due to microsponges found at the tip of their tongue. We assume that there is some cost to puddling, but there aren’t many studies on the subject. Basically, if you like butterflies, and want to go into research there’s a big gaping hole in the butterfly research waiting just for you! Krenn, HW. 2010. 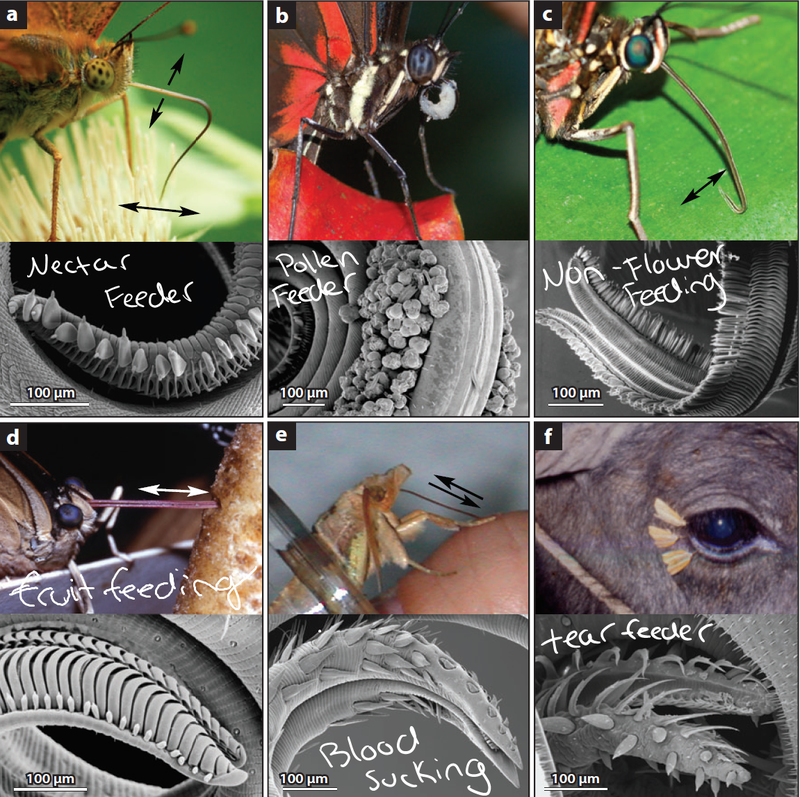 Feeding mechanisms of adult Lepidoptera: structure, function, and evolution of the mouthparts. Annual Review of Entomology 55: 307-327. 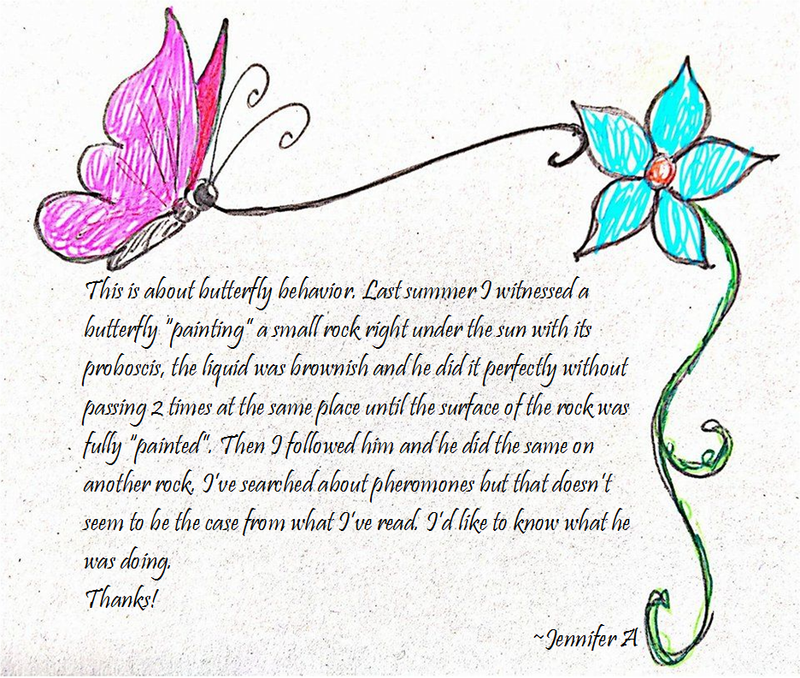 This entry was posted in Behavior, Ecology and tagged Butterfly, Lepidoptera, mud-puddling, puddling, tongue. Bookmark the permalink.